We arrived in Walvis Bay on the west coast of Namibia a week ago. Walvis Bay is one of the main ports on the south-west coast of Africa, linking the Atlantic ocean to the interior via the Trans Caprivi Highway. Although it’s a relatively small town, it’s a major port and has been an important town historically. In fact, when Namibia finally became independent from South Africa in 1990, it was another two years before Walvis Bay was relinquished, such was its commercial importance. When we were planning our trip Walvis Bay was the obvious choice for the start of our journey across Africa. We needed to ship the car and equipment from the UK so we found a port that was close to the African countries we hoped to visit. Our research showed that there would be plenty of options for getting the car and equipment onto a ship bound for Walvis Bay. Quite early on in our planning, we were fortunate to receive support from the global logistics firm DB Schenker, who took control of the organising our car’s journey from the UK to Africa. Back in February, with the help of DB Schenker, I’d driven to a remote packing warehouse in Tilbury, Essex, and waved goodbye to the car and some of our equipment as it was packed into a container and loaded onto a lorry to be taken to the docks. It subsequently crossed the channel by barge to Antwerp, before being moved onto the Green Mountain, a MACS line container ship. From there she sailed directly to Walvis Bay, carrying our car along with hundreds of other containers. Although the ship is sailing ‘directly’ here, it turns out that doesn’t quite have the meaning I was expecting. When I hear direct, it makes me think of urgency and speed. At Oxford train station, when you look at the departures board for ‘The next direct train to London’ this is also, usually, the fastest. We’d been led to believe that the whole shipping process would take 3-4 weeks, so having got rid of the car in mid-February, just four days after we’d received it from Jaguar Land Rover, we were confident that we’d be able to start the trip in the last week of March, some 5 weeks later. However, when it comes to shipping, direct appears to have a different meaning. The speed at which these vessels move is dictated by many things, from the vagaries of ocean traffic and weather, to the queues of ships waiting to be discharged at the port of arrival. All of which are out of anyone’s control, including DB Schenker’s. So having hoped that we’d be good to go by now, this is why, a week after our initial proposed driving start date we’re still holed up in Walvis Bay. Notwithstanding this slight delay, we’ve been grateful of a bit of extra time before we take off. No thumbs have been twiddled, and we’ve been far from idle. We’ve also managed to ignore the attraction of the Namib desert, whose orange sand dunes are all around and which, juxtaposed against the sea, create both a constant onshore wind and provide an inkling of what the fabled Skeleton Coast to the north must look like. A large amount of tourism to Walvis Bay and its sister town of Swakopmund 30km north is due to their position as the gateway to the desert. There are any number of adventure activities to get involved in, from quad biking in the dunes to camel safaris in the desert. But we have resisted this, partly because we have a pretty exciting and challenging 6,500km drive across Africa to look forward to, but mainly because we’ve got work to do. A large part of our mission is to provide training on portable genetic sequencing and its analysis, so a few days in quiet Walvis Bay has afforded us time to pull our teaching materials together and prepare for the work we’ll be doing as we drive. We’ve also had time to visit our colleagues at the University of Namibia (UNAM) in Windhoek, Namibia’s capital, which is around 350km away. On Tuesday, driving a hire car, Isaac and I travelled the four hours on a tarmacked road from the coast, through desert and progressively greener savanna until we arrived in Windhoek. About 100km out of the city, after we had passed through Okahandja, the road started to become both very good and very wide. Although unfinished, the road was in fact so wide that it looked almost like a European three-lane motorway. We later learnt that there has been significant investment in Namibia’s infrastructure by the Chinese, but as we entered the capital we were suitably impressed by the quality and ease of our drive. The following day we visited UNAM for a morning of meetings with some malaria researchers and geneticists. Visiting their campus in the south of the city, which had been repurposed since its original construction in the 1970s as a teacher training campus, Isaac and I found a bustling undergraduate campus, throbbing with students running late to their lectures. We were there to meet with Prof Davis Mumbengegwi, one of the foremost malaria geneticists in Namibia. I’d been in email contact with Davis over the preceding months and he’d been incredibly helpful with bringing me up to speed on the many logistical challenges of doing research in Africa. As well as learning about his work, we are also hoping that Davis will accompany us next week as we drive up to the north of Namibia where the country’s malaria burden is concentrated. Unanimously referred to as ‘Prof’, Davis is a bright, affable Zimbabwean who, following an undergraduate degree in his home country, moved to Hull to do a masters in biotechnology and then Manchester for a PhD. Following a couple of postdocs in North America, the result of which is that one of his children has a Canadian passport, he joined UNAM ten years ago and has since built a career working on malaria and other infectious diseases. Isaac and I spent a few hours with ‘Prof’ and his team, talking about their work in malaria and learning about some of the research that his PhD students and postdoctoral researchers were up to. As well as genetics, we learnt that Davis works with indigenous people across Namibia to try to understand if particular traditional medicines have anti-malarial activity. Of particular interest to us was the work of Munya Tambo, Davis’s PhD student who has been developing methods that use DNA sampled from parasites in the Kavango and Zambezi regions in the north to try to understand the connectedness of populations. Working with colleagues at UCSF in the USA, his work uses genetic markers called microsatellites that are typed from parasite DNA samples taken from blood spots. Whilst this data is extremely cheap to generate, it only represents a fraction of the malaria parasite genome. Munya’s work with Davis and UCSF has nevertheless shown that parasites in the North of Namibia are closely related to each other which is likely the result of people moving along the parasites along the region. It was really exciting for us to share our experience of developing portable nanopore sequencing with Munya. Although we’ve still got a lot of work to do to really optimise the lab protocols to be cheap and easy to use, Munya is exactly the sort of scientist who could benefit from the technology that we’ll be trialling on the Mobile Malaria Project. Whilst it was a shame that Jason, our team member in charge of nanopore sequencing, was not with us for this particular meeting (he stayed back in Walvis Bay to concentrate on further developing our training), both Munya and Davis will be travelling with us to the north of Namibia next week, so there’ll be plenty of opportunity for us all to discuss the technology further and hatch plans for the future. Davis also managed to arrange a meeting between the MMP and the Elimination8 Secretariat (E8), a regional advocacy group that is headquartered in Windhoek. Before lunch, we drove from the UNAM campus to an office block in downtown Windhoek. After climbing a short block of stairs, we were honoured to meet Peter Okwi, Acting Director of the Malaria Elimination 8 Secretariat and Phelele Fakudze, Head of Advocacy. Although I’d read a little about the organisation, it was exciting to have an audience with some of the leadership as we were keen to learn about what they’ve been doing. 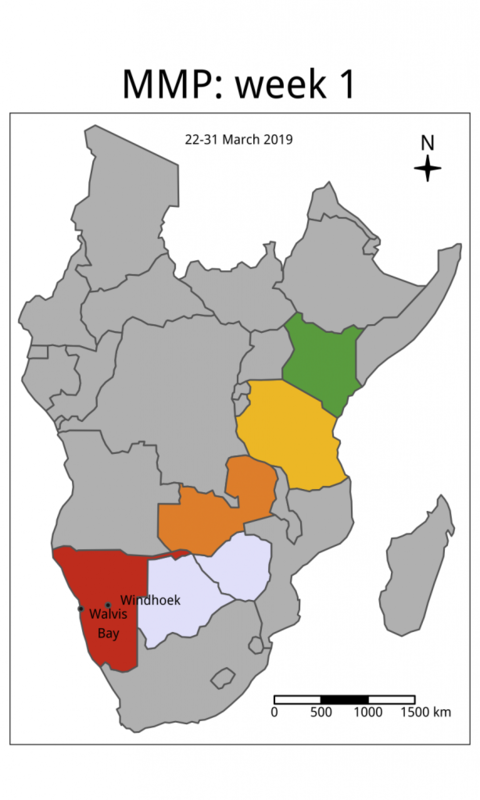 Elimination8 works across eight southern African countries (South Africa, Namibia, Angola, Botswana, Zambia, Zimbabwe, Mozambique and Eswatini) to try to enable collaboration across the region. In the words of Peter, “parasites don’t know about borders”, so by coordinating their work at a regional level, rather than by country, their proposition is that malaria elimination efforts should be both strengthened and more effective. Although the concept of a transnational body focused on eliminating malaria in southern Africa was mooted 10 years ago, the E8 only came into existence in 2015. For a number of reasons 2015 was an important year for malaria. A landmark study showed that malaria prevalence across Africa had reduced by almost a half since 2000 levels, and for the first time showed the crucial impact of different interventions, in particular the use of bed nets. There were also a number of high level global initiatives (e.g. EndMalaria2040) which aimed to coalesce on and articulate plans for eradication. The general mood at that time was optimistic and there was hope that if we continued to do what had been done over the preceding 15 years, then malaria would be eradicated globally by 2030. Our visit to Elimination8 in Windhoek (from left, Davis Mumbengegwi, George, Phelele Fakudze, Peter Okwi, Isaac, Munya Tambo). Unfortunately, we now know that this was a high point, and that the actual result of these positive results was that we all took our eyes of the ball. Malaria dropped down off priority lists and complacency swept in. Reductions in malaria incidence have since stalled, prompting Dr Pedro Alonso, head of malaria at the WHO to say in 2018 that ‘history has taught us well that when we lift our foot from the accelerator malaria comes back with a vengeance.’ Malaria is a complex, multifacted topic, a complete description of which is far outside the scope of this article. However, the salient point that we’ve learnt is this, we cannot continue to work with a ‘business as usual’ mindset if we are to ever hope of eliminating malaria. Which brings us back to Elimination8 and how their work is both innovative and forward thinking. Amongst the many initiatives that Elimination8 have started over the last few years, the one Phelele is most proud of is that malaria is now on the agenda of health ministers in the eight countries where health resources have traditionally focused on HIV and poverty. At regional meetings, health ministers have specific sessions on malaria and are committed to working together to control the disease. Focusing on getting buy-in for the malaria agenda at the very highest levels means that its importance trickles down through the system and things get done. Moreover, by working together rather than chasing funds for their own country, health ministers are now beginning to understand that investment in malaria control in other countries can ultimately help their own. Peter Okwi listed two achievements. There is now an increased pool of technical capacity across the region. The E8 are helping to train more microscopists and entomologists, which is expensive, but the supra-governmental role that the E8 has means that these resources can be shared across countries according to need. Secondly, funders have traditionally been wary of giving money to regional initiatives. They’re hard to pull off because they require a unique coordination strategy and every country has their own accountabilities and interests that don’t always align with those of their neighbours. That Elimination8 has had success shows that regional grants can work. As Peter said “the world is sitting up and taking note of the concept that a regional approach to malaria elimination can work. In West Africa, for example, they recently started something similar to what the E8 is doing, the Sahel Elimination Initiative. These countries are planning to pool resources and harmonise policies, just like the E8.” That other regions are basing their structures on the E8 demonstrates that they are on to a good thing. We left the secretariat in buoyant mood, enthused by the people we’d met and their passion and the clarity of their mission. Davis’s last comments in particular rang through. It’s clear that in this part of Africa, a broad, multidisciplinary and multinational approach has been both adopted and is effective. Collaboration and community across borders works. Back in Walvis Bay, we’re still waiting for the car. The latest is that we should have it early next week. By then I’m sure we’ll be ready to start our journey north and the frustration of waiting will be replaced by fascination of the new places that we’ll visit and people that we’ll meet. thanks Ron! Sorry not to have caught up with you before we left, but will definitely call in when we’re back. a few plans for the future and it is time to be happy.